Crisp and slightly sweet with fresh, juicy strawberries, this recipes has evolved from it's original creator (and one of our Blogger Clue Directors), Liz Berg of That Skinny Chick Can Bake. Stacy's link to a Strawberry Simple Syrup can be found in her post should you prefer a sweeter recipe, but I chose to use strawberries only for my version. As our berries were fresh and plump from the farmers market, no additional sweetening was needed, and the cocktail proved a perfect complement to spontaneous brunch. Perfect of wedding and baby showers, New Years Eve, or simply just because, the reddest, sweetest berries will bring a sweet love to your drink. Puree strawberries in a food processor or blender (just a few for a few drinks, more for larger parties). For juice without the seeds or texture, press the berries through a fine mesh strainer to extract the juice only. 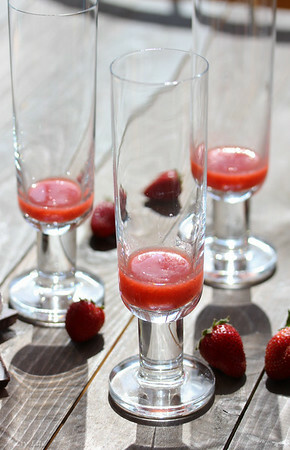 Pour 1-2 Tbs of the strawberry puree into the bottom of fluted glasses. 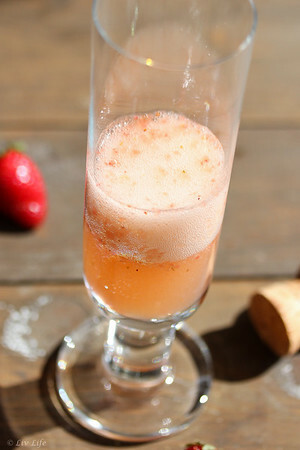 Top with chilled sparkling wine and enjoy! *Liv Life Note: If your strawberries are not particularly sweet, see Stacy's post for a Strawberry Simple Syrup recipe to perk up the sweetness. Cheers right back at you Liz!! You deserve that cocktail. The life of a Mom can be exhausting which is why God chose to make it so rewarding as well. I'd say you definitely deserved that strawberry cocktail. What a great post...and I have tears and smiles that your day ended with love and appreciation. Who cares that the cocktail was the next day? It looks perfect! What a sweet and wonderful story, Kim! Mom is the best job in the world, even when no one is appreciating us but satisfaction rates soar when we hear those words that lift our spirits. I'm so glad that you enjoyed the Champagne cocktail. You certainly earned it! Cheers back at ya, Kim! A very "heart melting" post. A lovely post! It just demonstrates how a mothers job is never done…Mother’s day or not! Glad you finally enjoyed your Champagne cocktail! It looks fabulous! Kim, just reading this brought that wee lump in the throat. I totally hear you! There are times when I feel that twitch of resentment when nobody notices the little details - especially on Mother's Day when extra (ultra?) sensitive - but it's so true what you say. It is so worth it and rewarding - look at what an amazing family you have. 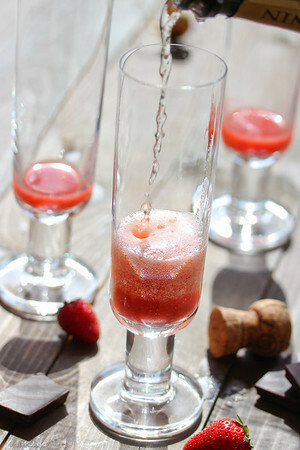 Cheers to many of these beautiful bubbly strawberry cocktails, when your Mother's Day is deserved every day, my friend! Awww, I'm actually a bit choked up over here...tears in my eyes and all. Sometimes we realize perfect is an entirely different thing than we first thought. That is a beautiful, amazing picture of your daughter...and these cocktails sound amazing. Perspective, eh? Wow. I'm amazed at how perfectly you described what goes on in my head many days (especially the help in the kitchen thing). That being said, I'm always telling people that being a mom is my career and everything else is just a job. So, I raise one of those amazing cocktails to you and the way you excel at your career! Brava. What a perfect selection to sooth your busy lifestyle! It was so wonderful to have your blog this month! Your daughter is amazing and I am always in aw of how talented she is! The Friday Night Bite invitation is always there for you! Love how it all turned out! I would also love if you would link this up to Tipsy Tuesday at Grey is the New Black! You are a wonderful mom Kim - I love how you love your kids. So sorry you had a hectic Mother's Day, but the love and support of your children and husband definitely make all the hard work worth it and knowing they appreciate you is all the gift you need. (And maybe a load of dishes done for you too ;) ) I'm glad you still got your cocktail even if it was a couple days late.